The fraternal filmmakers Jay and Mark Duplass have reached an artistic crossroads: their early movies (The Puffy Chair, Baghead) owed much of their charm to the naturalism of nonprofessional actors, but the brothers are now bankable enough to attract (and want) Hollywood stars. Cyrus (2010) worked beautifully because its three leads (John C. Reilly, Jonah Hill, Marisa Tomei) understood the brothers' low-key, improvisatory style; the same can't be said of this follow-up effort, whose credibility is ruptured by a stridently shticky Ed Helms (The Hangover). Jason Segel plays the title character, a good-hearted stoner who sees mystical connections in random coincidences; Helms is his selfish and abrasive brother, Judy Greer the brother's fed-up wife, and Susan Sarandon the men's crabby mother. There are some funny scenes in which the two brothers spy on the wife, who may be having an affair, but the movie's climax is a badly contrived attempt to ratify Jeff's notion of personal destiny. 21 Jump Street, Rampart, Friends With Kids and film events around town. Strong acting drives stoner/family comedy. 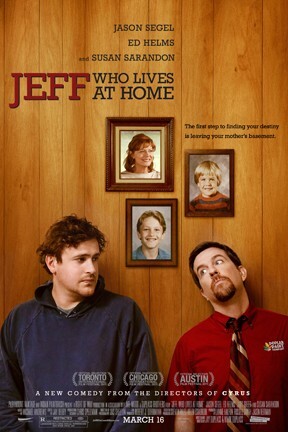 Jeff, Who Lives at Home is not showing in any theaters in the area.